A gift of nature and gold of desert, the camel milk (CM) is miraculously proving as a superfood and natural flush. Because of the appreciable level and unique combination of nutrients (minerals, vitamins, protein, and fatty acids etc. ), CM has medicinal properties covering a wide range of ailments. Camel milk is use as the aphrodisiac, especially in the stressful conditions of the dry hot weather. The appealing level of Nanobodies in CM making it very special tonic for making the mood. As well as CM is a nervine tonic and helps in good eyesight. The pastoral people depending on camel milk rarely get weak eyesight. A Natural Recipe for Amazing Skin: The content of niacin (Vitamin B3) in camel milk is remarkably higher than in cow milk. Vitamin B3 supports the function of the digestive system, skin, and nerves, and improves circulation making it a beauty and health tonic. Camel milk contains five times more vitamin C compared to cow milk. Vitamin C is anti-infectious and is very important for human health, especially in dry and deserted areas. The wonderful protein of CM (protective amino acids and immunoglobulin) is a booster of the immune system and nutritional advantages for brain development. CM contains 25-30 times as much lactoferrin as cow milk. Lactoferrin is a fairly recently discovered iron-containing protein that has been shown to have antiviral, antifungal, anti-inflammatory, analgesic and anti-carcinogenic effects. Therefore, a combination of lactoferrin (bactericidal and iron-binding properties) and lysozyme ( an enzyme which catalyzes the destruction of the cell walls of certain bacteria) ensure super immune system. A recent study revealed that camel milk has anti-genotoxic (prevent toxification in gene and prevent mutation) and anti-cytotoxic (prevent toxification in the cell). The Nanobodies play an incredible role in this regard. Children diagnosed with autism spectrum disorder (ASD) responding positively after therapy that included camel milk. The low quantity of beta casein and the lack of beta-lactoglobulin are linked to the hypo-allergic effects of camel milk. Because of the low lactose content, it does not cause lactose intolerance problem in infants. CM has 100 times more D-Lactate as compared to cow milk. D-Lactate is very health promising contrary to L-lactate which is toxic and causes an allergy found in cows’ milk. Camel milk can be the best replacement of infant food after the mother’s breast because of its child-friendly lactose. In spite of the uniqueness of camel milk, the awareness among the young generation is very superficial. They prefer Redbull, soda water, Coca Cola, and Pepsi like soft drinks which are a burden on the physiological system of the human body and give very temporary freshness and satisfaction. The taurine (synthetic) in the Redbull is an alarming threat to brain health and has been banned in some Scandinavian countries. I would suggest UAE government promote camel milk among young generations and take it as a part of Emiratization initiatives. UAE is the only country at a global level producing bulk quantity of pasteurized milk which is a pure Emirates product. A wide range of camel milk products are available in the market ranging from Icecream to flavoured milk. Camelait! 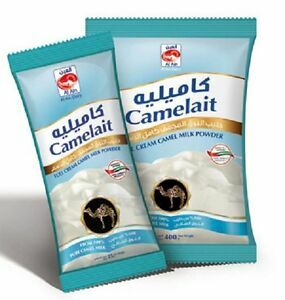 Al Ain Camel Dairy ProductsThe expats of the UAE can gift camel milk powder to their friends and families in their own countries.